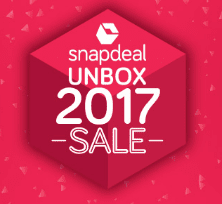 Hello Dealsnloot Readers,Snapdeal is offering on 17th-19th December Snapdeal Unbox Sale 2017. This offer Is Applicable on fashion, appliances, gadgets, smartphone, electronics and much more. Snapdeal is again coming up with Snapdeal Unbox Sale 2017. Get upto 70% off on Fashion, Appliances, Gadgets, Electronics and more on 17-19 Dec. Cash ho na ho, Life ke sabse important transactions rukne nahi chahiye.So Hurry !!! Grab This Shopping Loot Deals. How to Buy Online Snapdeal Unbox Sale 2017 ? Offer Duration: Valid till 19th Dec, 2016.